The WICUS Scientific Virtual Appliance ontology describes the virtual computational resources used for executing scientific experiments, usally as Virtual Machines deployed on a IaaS provider or a virtualization solution. This ontology is part of the WICUS Ontology network. 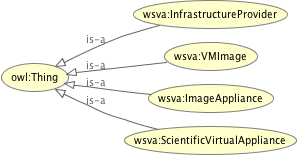 This ontology describes the concept of wsva:ScientificVirtualAppliance, a computational resource described as a Virtual Machine with a set of software components deployed on it. These resources define a set of features specifically designed for supporting the execution of a scientific workflow. wsva:ScientificVirtualAppliance is based on an wsva:ImageAppliance that aggregates a set of wsva:VMImage that can be used for enacting a Virtual Machine in a certain wsva:InfrastructureProvider and then configured to expose the capabilities of the appliance. The taxonomy of this ontology is depicted in Fig. 1. For more information about the classes and properties of the ontology check the following sections. Figure 1. Taxonomy of the Scientific Virtual Appliance ontology. A wsva:ImageAppliance represents an image specification supporting the instantiation of an appliance in an infrastructure provider platform. A wsva:InfrastructureProvider represents a service provider offering computational resources on demand. A wsva:ScientificVirtualAppliance represents a computational resource that may have been tuned for scientific purposes. A wsva:VMImage represents a Virtual Machine image that defines the basis of an appliance. wsva:hasVMImage links a wsva:ImageAppliance to the set of wsva:VMImage that supports it. wsva:isSupportedBy links a wsva:ScientificVirtualAppliance to the set of wsva:ImageAppliance that supports it.